About 70 miles north of Phoenix, high in the Arizona desert, a blocky, concrete series of buildings rises out of the hillside. It looks like a cross between a futuristic museum and a desert village on Tatooine. But this isn’t your typical example of post-modernism. It’s an experiment in “arcology,” a style of design that combines architecture and ecology to minimize the impact of man-made structures on the environment. The complex, called Arcosanti, was begun in 1970 by Paolo Solero, who first popularized the concept of arcology. He imagined the project as a protoype of a walkable urban center where people could live and work sustainably. There are over a dozen buildings at Arcosanti, all specifically designed to interface with Arizona’s climate. Open window plans reduce the need for artificial lighting, and the concrete structures soak up sunlight during the day and retain heat during the cool desert evenings. The color scheme matches the surrounding desert, with artwork and architectural flourishes giving it some contrast. The buildings are all closely linked, reducing the need for vehicles and prioritizing pedestrian access. Arcosanti functions primarily as an experimental laboratory and education center. There’s a visitor’s center with a cafe and gift shop that’s open each day from 9am to 5pm, with up to 50,000 people visiting each year. You can also book a stay in a guest room or attend a multi-week “experiential learning” workshop. Around 50-100 people live in the complex year round. Some are students and researchers working on agricultural projects, while others are involved with Cosanti Originals, a bell-making studio and gallery on the site that creates artwork out of bronze and clay. 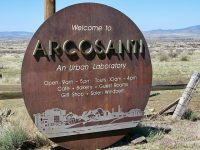 While Arcosanti may be the first working prototype of Solero’s design, many of the principles of arcology can be found in urban areas around the world. Cities like Montreal and Minneapolis incorporate underground tunnels and skyways as a way to adapt to the cold climate. Even the Las Vegas Strip uses arcology principles as a defense against the heat. Visitors can travel (and even live year-round) protected from the elements. The residents of Arcosanti want to see these ideas more widely adopted. “We imagine that if cities were devised in the proper form, then something wonderful could happen,” says Jeff Stein, in this video profile of Arcosanti. One proposal calls for an expansion of the Arcosanti complex, with over 5,000 people living and working on site. As our climate changes and population grows, experiments like this one could offer models for more sustainable, pedestrian-friendly living in a variety of landscapes and environments. 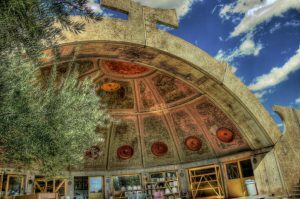 Want to learn more about Arcosanti? Check out their website and Twitter page to find out the latest news about workshops and other activities. If you’ve visited Arcosanti, post your experience in the comments below! Panorama by Chris Ohlinger, General Manager of Cosanti Originals, Inc.
Arch photo by CodyR. Main photo by Al_HikesAZ.